Thursday, February 23, 7:00 p.m.
Tales from the Zirzameen reflects on Iranian culture and society as well as the American expatriate culture there in the 1970s. The short stories relate how the author became totally assimilated there, and he shares his experiences leading up to the revolution and in its aftermath. The book is relevant and funny in addition to its serious side. Despite the circumstances under which the he left the country-including being taken hostage for a time-the author celebrates the hospitality and rich culture of the Iranian people. He was welcomed warmly into their society and came to appreciate the sincerity and kindness that characterized the people he met. Brian Hanson Appleton aka Rasool Aryadust was born in Tokyo, Japan, and grew up in Greece and Italy as a self-described ''army brat.'' As an adult, he lived in Iran for five years before, during, and after the Iranian Revolution of 1979. Prior to working there, he attained a bachelor of arts degree in anthropology from George Washington University, graduating Phi Beta Kappa. He recently received his master of arts degree in ancient history from the International University of Fundamental Studies Oxford Educational Network, Saint Petersburg, Russia. Mahbod Seraji's book Rooftops of Tehran was available from LibraryThing Member Giveaway. 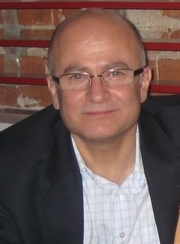 Mahbod Seraji is currently considered a "single author." If one or more works are by a distinct, homonymous authors, go ahead and split the author. Mahbod Seraji is composed of 1 name.